MESAIEED, Qatar (VN) — The 2014 Tour de France sprint king Marcel Kittel (Giant-Alpecin) is having trouble racing at top speed due to a cold and missed training days in January. The finish of the fourth stage outside Mesaieed’s mosque would have been ideal for Germany’s Kittel to win his first UCI-ranked race of 2015, but instead, he told the team to sprint for Nikias Arndt. Kittel helped pull the train along, eased off, and finished behind the main bunch. 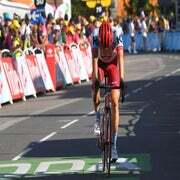 Arndt placed third behind stage winner Alexander Kristoff (Katusha) and Peter Sagan (Tinkoff-Saxo). Kittel looked nothing like he did when he won in Harrogate at the Tour de France on day one and took the yellow jersey. Or in the three other stages that he won, including the one on Paris’ Champs-Élysées. Of course, the Tour of Qatar is not the Tour de France, but still, Kittel is hungry to win. Besides the unofficial People’s Choice Criterium ahead of the 2015 Tour Down Under, the six-foot-two blond has not celebrated victory since the London stage of the Tour of Britain in September. In Qatar, Kristoff sprinted to two stage wins and José Joaquín Rojas (Movistar) won the other bunch kick. Kittel wanted to have his chance, but he is paying for a cold and missed training after the Tour Down Under. “He expects that when he is going to a flat race like this that he can compete with the best when he’s going for the sprint, but the team is not pressuring him because it’s only the Tour of Qatar,” sports director Marc Reef told VeloNews. Kittel arrived to the team’s car after the Wednesday stage and remained quiet. His teammates congratulated him on his effort to help Arndt sprint for the podium, but he shook his head. “I’m still struggling now with the condition I lost in the time that I was sick,” Kittel continued. 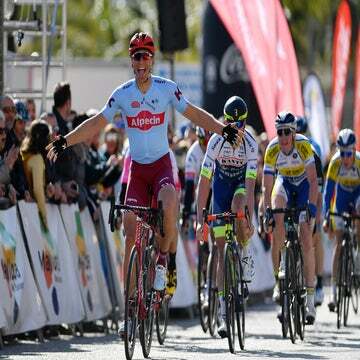 Kittel missed six to seven days of training after returning from Adelaide, Australia. He has two more days in the Tour of Qatar, where the last stage into the capital city of Doha could suit him. He will fly from Qatar to Germany after the race and train with his team at a camp before the Giant’s first big race of the year, the Tirreno-Adriatico stage race. At that point, he should start to fire again. “It depends on which part of the season you’re in, if this is the build-up or if this is the goal itself,” Reef said.